Jeff Head/FlickrThe first Zumwalt-class destroyer, USS Zumwalt, DDG-1000. 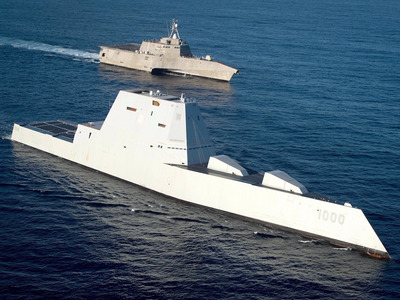 The Navy has requested funding to equip its Zumwalt-class destroyers with new missiles designed to allow them to take on other surface vessels at long ranges, Defence News reported, citing budget documents. 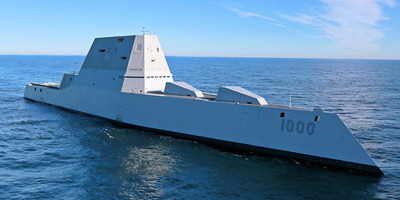 The Navy is asking Congress for funding to equip its most technologically advanced surface ships, the Zumwalt-class stealth destroyers, with new weapons designed to turn them into long-range ship killers, according to budget documents spotted by Defence News. One of the new weapons is Raytheon’s SM-6 missile, which serves three purposes: anti-air, anti-surface, and ballistic-missile defence. US NavyThe USS Zumwalt with the USS Independence and the USS Bunker Hill. The missiles would be a much-needed addition to the destroyers, as the ships’ main armament, the 155mm Advanced Gun System, is unusable because it has no ammunition. The kind intended for the guns was deemed too expensive, ranging from $US800,000 to $US1 million for a single round. The guns will remain on the destroyers, but “in an inactive status for future use, when a gun round that can affordably meet the desired capability is developed and fielded,” the budget documents say, according to Defence News. The Navy decided in November to change the Zumwalt-class ships’ role from land-attack to anti-surface warfare, the documents say. The commander of US Pacific Command said in congressional testimony last week that the change was motivated by China’s increasingly capable navy and the need for more surface ships capable of dealing blows in ship-to-ship combat, Defence News reported. All three Zumwalt-class destroyers will be based in the Pacific, the Defence News report says. 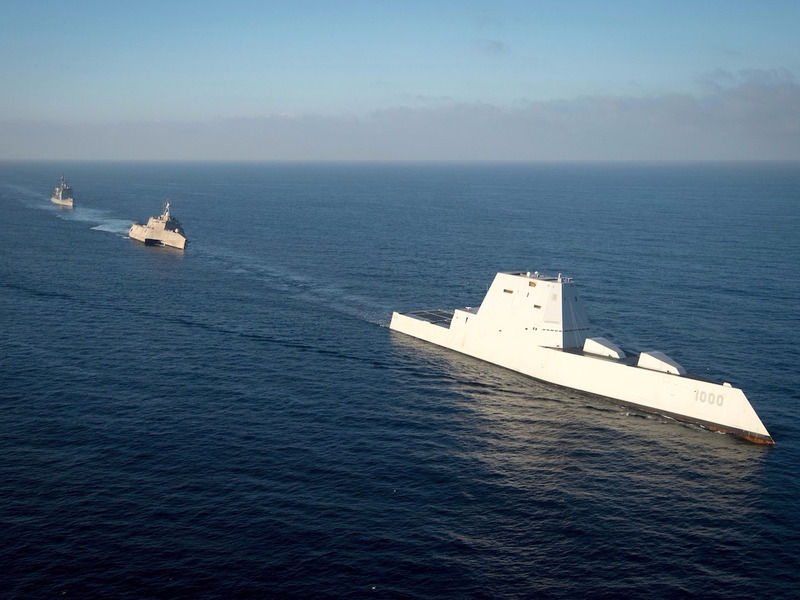 There are two Zumwalt-class destroyers. The USS Zumwalt is now in its homeport in San Diego for overhauls and a weapons installation, Defence News reports, while the USS Michael Monsoor completed its acceptance trials earlier this month.